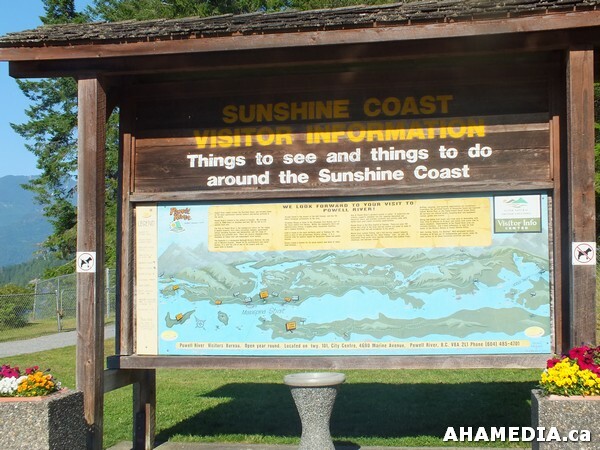 The Sunshine Coast is a region of the southern mainland coast of British Columbia, on the eastern shore of the Strait of Georgia, and just northwest of Greater Vancouver. It is generally considered to encompass the coastal areas of the regional district of Sunshine Coast, as well as the regional district of Powell River up to and including the village of Lund. While populous and frequently visited by tourists, it can be reached only by using a ferry or float/airplane; because of the steep, rugged terrain, no access roads have been built from the rest of the province. The area around nearby Powell River, also on the mainland and inaccessible by road, is also considered part of the Sunshine Coast, while some people use the name to refer only to the area between Langdale (south) and Egmont (north). Major population centres on the peninsula include Gibsons (near the BC Ferries terminal at Langdale, for vessels coming from Vancouver), Roberts Creek, Sechelt, Halfmoon Bay and Secret Cove (in between Sechelt and Pender Harbour) andPender Harbour. At the north end of the peninsula, the ferry to Powell River docks at Earl’s Cove which is also near Skookumchuck Narrows, where the skookumchuck, the world’s biggest tidal marine rapids, pass the tidal flow from Sechelt Inlet. A popular destination in the area is Desolation Sound which is beyond the end of Highway 101. The highway ends near the settlement at Lund.